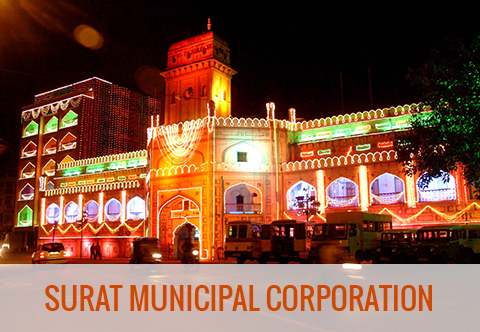 The District Judge of Surat was used to handle the city administration in 1846, and hence he shouldered the responsibilities of maintaining health and hygiene and collecting the revenue, which is presently being done by the Municipal Corporation. 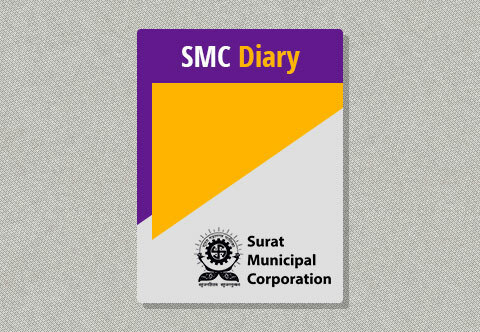 Under the Municipal Act of 1850, Mr. Roges the contemporary collector of Surat, established the office of Municipality on 23rd April, 1852, the first meeting of which was held on the 15th The Collector of Surat was an exofficio President of the Municipality. His office, in the initial stage, started functioning in a hall of the Nanpura Post Office building, but with the expansion of its work, the hall and the building could not accommodate the Municipality office and hence it required a larger premises. The building, presently used by the Municipal Corporation was built in 1644 in the reign of Mughal emperor Shahajahan, by one of his military officers, and it was known as. It was used as the caravanserai or the waiting room for the. At that time the said building was in a very worn-out and neglected condition and was owned by the government. Mr. Hope recommended the government to allot this building for the Municipality. 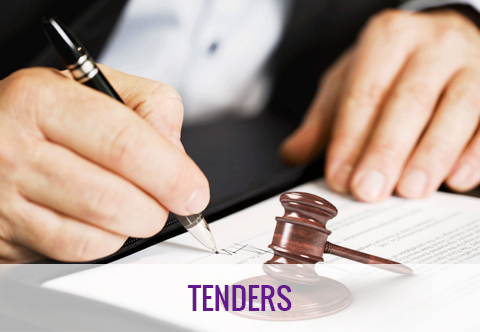 The Municipality spent Rs.29,500/- for its renovation and repairs and turned it into an office building. It also underwent some need-based addition-n-alteration from time to time. Thus, The Municipality, along with its public services acquired and adorned its own office building. 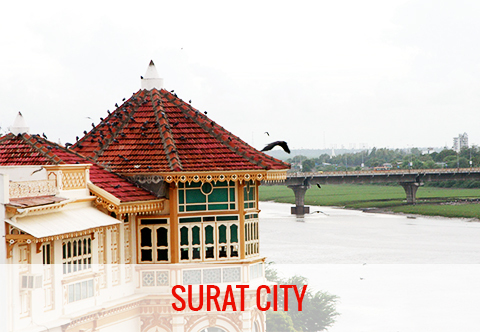 The Municipality served successfully to beautify Surat and to maintain its health and cleanliness for years together. 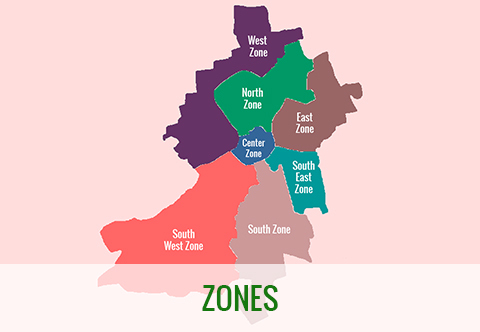 But looking to its expansion and increase in population it became evidently necessary to transform the Municipality into Municipal Corporation, and it was done on the 1st October, 1966. As far as the local administrative bodies like Municipality or Municipal Corporation is concerned, they are supposed to perform certain obligatory duties-under 1949 Legislative Act of Mumbai Regional Municipal Corporation - such as to provide water, electricity, roads, and to maintain cleanliness for the general health of people and that of the town, At the same time there are certain voluntary functions like establishing and maintaining kinder garten centers, Libraries, Museums, Auditorium. Theaters, Gardens, Zoo and so on under the by-law article No.22 of section 66 of the said Act, the Municipal Corporation may contrive for the establishment and maintenance of Libraries and Reading Halls according its own discretion. 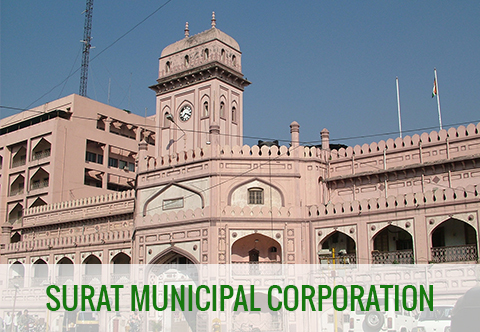 After the conversion of Municipality into a Municipal Corporation, Late Mr.P.H.Parmar, the retired Chief Administrator and City Engineer, and a voracious reader, inspired an idea of establishing a Municipal Public Library for the first time in Surat. he was a great lover of books of different subjects including history. The Municipal was established during his tenure; but this library was open and free for the Municipal Corporation officers employees and for scholars pursuing higher studies. 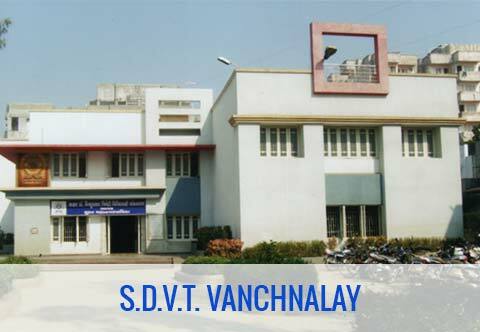 Shri A. Travadi Free Library (Estd. in 1915 by Shri Ganpatram Travadi). Thus it was a well-coming gesture of the Corporation to adopt public libraries for the citizens. But these reading rooms contained only newspapers and magazines. The readers had to sit there and read them. Various sorts of reading material published in the book form was not available for the readers to carry home. During this time other libraries like Govt. District Library and Private Libraries issued the readers, the books they like to read at home. So, the Corporation, with an idea of setting up a well-equipped library, established its first public library (Gandhi Smruti Library) in 1981 in Gandhi Smruti Bhavan. The Library provides the reading facilities to the public by charging nominal fees. People can read newspapers and magazines there and can carry books at home. This library had nearly 28000 books on various subjects and had subscribed around 100 journals and magazines, prior to the establishment of The Narmad Central Library. In addition to its obligatories duties, under B.P.M.C. Act, mentioned above, the Corporation has remained conscious and active to perform certain voluntaries services as well. Though, there had been a public library since the time of Municipality, but its use was very limited. Therefore, the corporation determined to develop on a large scale well planned and well-equipped, modern library with the latest facilities which could serve the intellectual nourishment of public. 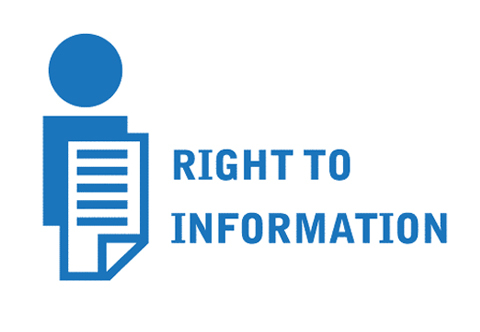 It may be useful to children, young people, a senior citizens, ladies, scholars, researchers, businessmen, officers and public at large. Such a rich and multi-purpose library was the need of the hour. And the corporation realized the need and responded to it positively. The selection of site and location of a library also plays an important role to attract and satisfy the readers. Ghod Dod Road is a peaceful zone, free from industrial pollution and noise of heavy traffic. The location of The Narmad Library is in the halcyon surrounding, amidst posh societies and educational institutions. So the students of schools and colleges and book-loving citizens can take maximum advantage of the reading facilities. One of the objectives of such a library is to offer all possible facilities and resources at a nominal fees to the researchers and eager readers, when the rare books and eager readers, when the rare books and unaffordable reading materials are not within the reach of common readers. The records of the library are also being computerized to enable the readers to know the availability or non-availability of books readily; and speedily. There are many libraries in the city, and some of them are very old, but they have been paralysed either due to economic constraints or in absence of scientific and systematic maintenance of books. In such a situation, the corporation has taken up the commendable task and a voluntary venture to establish a Central Library in Surat. Though there were many libraries in Surat and as they were poorly maintained, the corporation with the idea of establishing a full-fledged and well-equipped library in 1990-91, its silver-jubilee year. It was the consent of not merely having a four-walled building, some furniture, certain magazines, news papers and heaps of books, but it could be the centre of learning, fulfilling the broader and higher aims of gathering knowledge, a real store-house of knowledge, a real store-house of knowledge, a golden treasury of books. It could be the place that rediates the rays of knowledge of all walks of life, an authentic source to get information about science and technology, art and culture, literature and history, chemistry, physics, biology, medicine, zoology, botany modern thought philosophy and so on. It could make its readers visualize the genesis and growth of the entire universe and earth, the vitality and wonders of nature, the magnitude and miracles of the skies and waters, the multitude and mallifluousness of the living and non-living entities, and what not! 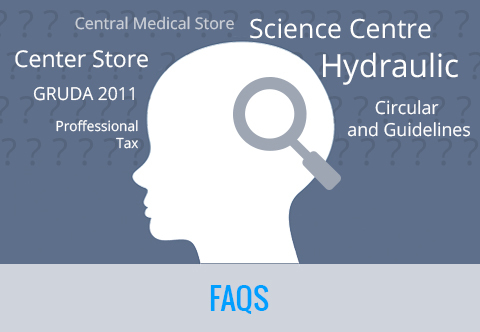 All such information should have been available at a place like the Central Library! 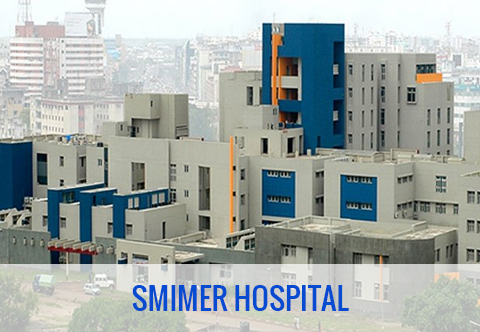 The Corporation set this herculean goal of an ideal library in the service of humanity and constructed a full-fledged building having all facilities suited to an ideal library and lunched the Narmad Central Library on a spacious premises. Thus, Surat Municipal Corporation dedicated "The Narmad Central Library" to the loving memory of late Shri Narmadashankar Lalshankar Dave a chivalrous poet, a great and enthusiastic social reformer, on the 24th day of the month of August in the year 1991, (Vikram Samvat 2047, Shravan Sud Poonam as per the Hindu Calender) in a graceful functions where the local dignitaries like Shri Ajitbhai Desai, the then Mayor, as the President of the function, Shri Bhagawatikumar H. Sharma an elderly journalist and a celebrated man of letters, as the special guest, and Shri Kashiram Rana, the then M.P. of Surat inaugurated this library. It was the day of Narmad Jayanti the birthday of Narmad, when Mr.Balwantsingh I.A.S. 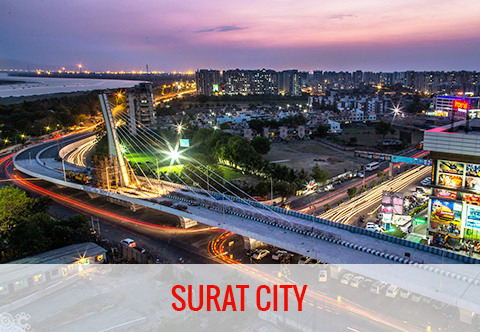 The Municipal Commissioner declared the library opened and dedicated it to the sagacious citizens of Surat. The nomenclature of the library is aptly associated with Shri Narmadshankar Dave, (Narmad as popularly known), who was an ardent activist to launch a compaign against orthodox rituals and rites, blind faith, superstition prevadent in his time. He was a great and glorious son of Surat fought against contemporary social evils single handed. He was as live and know redgeable as a university; and as diligent as a spider. Not only a staunch social reformer but Narmad was rightly honoured among the men of letters as 'the Primeval amongst the Moderns'. 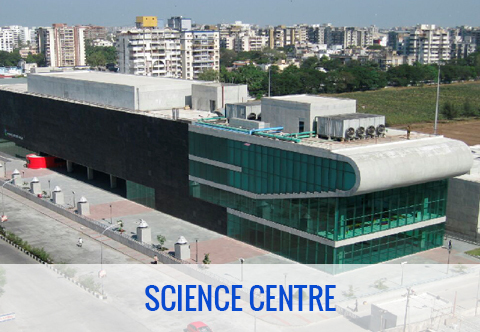 The name of such an illuminary is associated with this central library, which world rightly be 'a bridge of books' and the symbol of intellectual aspirations of the people of Surat. 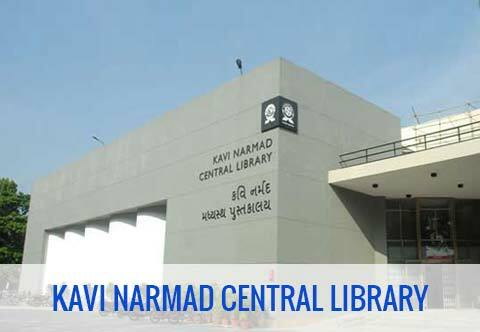 Such a luminous landmark in the history of Surat and its libraries, was set on the birth day of 'Kavi Narmad' (Narmad the poet) on 24th August, 1991.